On many occasions we would like to somehow get the dates belonging to the last day of current, previous or any other month, the first day of this month or any day of the current month. This post will show you a nice trick how to do that. 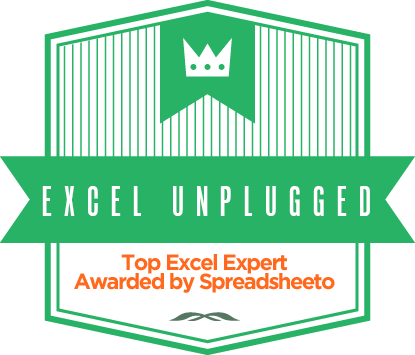 Whereas for the last dates of the given month the go to function in Excel would have to be EOMONTH (End Of Month), we will show a neat trick how to do this with a well-known Excel function called DATE. First off, let’s say we would like to get the date belonging to the last day of the previous and the last day of the current month. You can fiddle with the last argument to get to any month between Jan 1900 and Dec 9999. Keep in mind, that the EOMONTH function gives you only the serial number of the date, which you then have to format as a date. It should be said that the DATE function gives you more leeway than EOMONTH since it can return literally any day of the month you choose. =DATE(year,month,day) gives you the date you need or better yet the serial number belonging to the date you need. Now this trick with the zero as the last argument of the date function is genius. But even better, it can even go into negative. So you can do =DATE(YEAR(TODAY()),MONTH(TODAY()),DAY(TODAY())-2) gives you the date of two days ago. I can already hear you screaming what about the +1 on the month argument of the DATE function if the current month is December. Well you needless worry about that, you can easily go over 12 and the DATE function simply returns the month using the remainder after the number has been divided by 12 and even adds the number of years it get’s from the division by 12 to the year argument. Simply Brilliant and a great way towards that ever elusive Eternal Happiness. =Today()-2 is a slightly easier/quicker way to get the date 2 days ago. 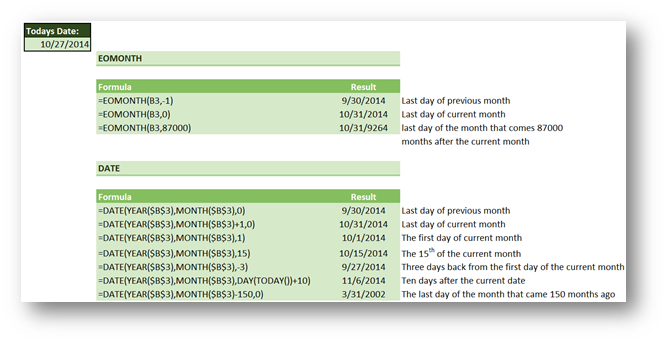 How would you calculate the first day of any prior month given TODAY()? is it possible to add on to an existing formula -1 work day ? I should have said the 1st working day after 19th in my original request but I’m not sure how to adjust the formula?! is it possible to get the expected answer? I am just trying to make simple calendar and I have put two input for the same I.e year and month how to get all the dates in columns for the same. Like I have 31 columns and in Feb only 28 days is there so other three column should remain blank. Thanks in advance. If the date is after the 20th of the month, I need to calculate the 20th of the next month. If it is before or on the 20th of the month, I need to have it returned the 20th of the month. For example if the date is 1/25/2019 I need the date return of 2/20/19. If the date is 1/15/2019 I need the date return to be 1/20/2019. What would the formula be?